Conley Equipment Company has been building our relationship with East Penn Manufacturing for over 20 years. That’s why we offer their Unigy I product line and their 12AVR100-ET telecommunication battery in particular. We believe their products combined with our expertise is what makes us your battery supplier of choice. If you don’t believe us, just see what some of our biggest clients like AT&T, Comcast, and CenturyLink have to say about about us. That 20 plus-year partnership has earned us the place as the largest value-added reseller for East Penn Manufacturing in North America. This means we can offer you the best rates on your products. We also have over 35 years of experience in the industry. This means you can trust us to offer only the battery products and services you need. By selecting East Penn’s Unigy I – 12AVR100-ET battery you know you’ll get one of the most reliable telecommunications batteries you can use for your systems on the market. East Penn places the highest emphasis on designing and manufacturing durable products that will last you for years to come. They also boast some of the lowest defect rates in the country. This means your telecommunications system will be powered by a battery you can rely on when the going gets tough. When it comes to the partnerships you make for your telecommunication systems needs, you can’t get any better than Conley Equipment Company and East Penn Manufacturers. If you’re ready to learn more or get your free quote, please fill out the contact form on the right. East Penn also puts out some helpful literature about their batteries. 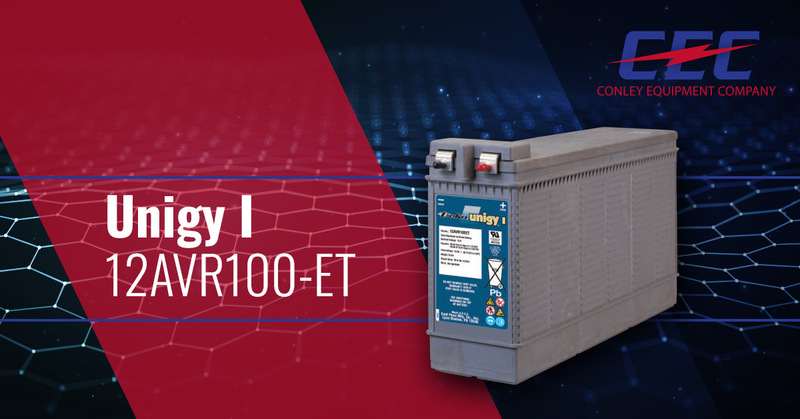 Read their Unigy I – 12AVR100-ET battery cut sheet here for more about the specifications and benefits of this telecommunication battery product.